in the EU, biopesticides have been defined as "a form of pesticide based on micro-organisms or natural products". 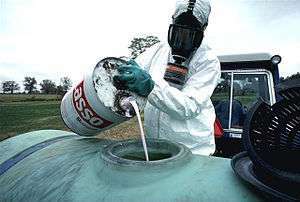 the US EPA states that they "include naturally occurring substances that control pests (biochemical pesticides), microorganisms that control pests (microbial pesticides), and pesticidal substances produced by plants containing added genetic material (plant-incorporated protectants) or PIPs". They are obtained from organisms including plants, bacteria and other microbes, fungi, nematodes, etc. They are often important components of integrated pest management (IPM) programmes, and have received much practical attention as substitutes to synthetic chemical plant protection products (PPPs). Bio-derived chemicals. Four groups are in commercial use: pyrethrum, rotenone, neem oil, and various essential oils are naturally occurring substances that control (or monitor in the case of pheromones) pests and microbial diseases. RNAi pesticides, some of which are topical and some of which are absorbed by the crop. Biopesticides have usually no known function in photosynthesis, growth or other basic aspects of plant physiology. Instead, they are active against biological pests. Many chemical compounds have been identified that are produced by plants to protect them from pests. These materials are biodegradable and renewable alternatives, which can be economical for practical use. Organic farming systems embraces this approach to pest control. RNA interference is under study for possible use as a spray-on insecticide by multiple companies, including Monsanto, Syngenta, and Bayer. Such sprays do not modify the genome of the target plant. The RNA could be modified to maintain its effectiveness as target species evolve tolerance to the original. RNA is a relatively fragile molecule that generally degrades within days or weeks of application. Monsanto estimated costs to be on the order of $5/acre. RNAi has been used to target weeds that tolerate Monsanto's Roundup herbicide. RNAi mixed with a silicone surfactant that let the RNA molecules enter air-exchange holes in the plant's surface that disrupted the gene for tolerance, affecting it long enough to let the herbicide work. This strategy would allow the continued use of glyphosate-based herbicides, but would not per se assist a herbicide rotation strategy that relied on alternating Roundup with others. They can be made with enough precision to kill some insect species, while not harming others. Monsanto is also developing an RNA spray to kill potato beetles One challenge is to make it linger on the plant for a week, even if it's raining. The Potato beetle has become resistant to more than 60 conventional insecticides. Monsanto lobbied the U.S. EPA to exempt RNAi pesticide products from any specific regulations (beyond those that apply to all pesticides) and be exempted from rodent toxicity, allergenicity and residual environmental testing. In 2014 an EPA advisory group found little evidence of a risk to people from eating RNA. However, in 2012, the Australian Safe Food Foundation alleged that the RNA trigger designed to change wheat's starch content might interfere with the gene for a human liver enzyme. Supporters countered that RNA does not appear to make it past human saliva or stomach acids. The US National Honey Bee Advisory Board told EPA that using RNAi would put natural systems at "the epitome of risk". The beekeepers cautioned that pollinators could be hurt by unintended effects and that the genomes of many insects are still unknown. Other unassessed risks include ecological (given the need for sustained presence for herbicide and other applications) and the possible for RNA drift across species boundaries. Monsanto has invested in multiple companies for their RNA expertise, including Beeologics (for RNA that kills a parasitic mite that infests hives and for manufacturing technology) and Preceres (nanoparticle lipidoid coatings) and licensed technology from Alnylam and Tekmira. In 2012 Syngenta acquired Devgen, a European RNA partner. Startup Forrest Innovations is investigating RNAi as a solution to citrus greening disease that in 2014 caused 22 percent of oranges in Florida to fall off the trees. Bacillus thuringiensis, a bacterial disease of Lepidoptera, Coleoptera and Diptera, is a well-known insecticide example. The toxin from B. thuringiensis (Bt toxin) has been incorporated directly into plants through the use of genetic engineering. The use of Bt Toxin is particularly controversial. Its manufacturers claim it has little effect on other organisms, and is more environmentally friendly than synthetic pesticides. However, at least one scientific study has suggested that it may lead to slight histopathological changes on the liver and kidneys of mammals with Bt toxin in their diet. plant disease control agents: include Trichoderma spp. and Ampelomyces quisqualis (a hyper-parasite of grape powdery mildew); Bacillus subtilis is also used to control plant pathogens. entomopathogenic viruses (e.g.. Cydia pomonella granulovirus). weeds and rodents have also been controlled with microbial agents. Chitosan: a plant in the presence of this product will naturally induce systemic resistance (ISR) to allow the plant to defend itself against disease, pathogens and pests. Biopesticides may include natural plant-derived products, which include alkaloids, terpenoids, phenolics and other secondary chemicals. Certain vegetable oils such as canola oil are known to have pesticidal properties. Products based on extracts of plants such as garlic have now been registered in the EU and elsewhere. Biopesticides are biological or biologically-derived agents, that are usually applied in a manner similar to chemical pesticides, but achieve pest management in an environmentally friendly way. With all pest management products, but especially microbial agents, effective control requires appropriate formulation and application. Biopesticides for use against crop diseases have already established themselves on a variety of crops. For example, biopesticides already play an important role in controlling downy mildew diseases. Their benefits include: a 0-Day Pre-Harvest Interval (see: maximum residue limit), the ability to use under moderate to severe disease pressure, and the ability to use as a tank mix or in a rotational program with other registered fungicides. Because some market studies estimate that as much as 20% of global fungicide sales are directed at downy mildew diseases, the integration of biofungicides into grape production has substantial benefits in terms of extending the useful life of other fungicides, especially those in the reduced-risk category. A major growth area for biopesticides is in the area of seed treatments and soil amendments. Fungicidal and biofungicidal seed treatments are used to control soil borne fungal pathogens that cause seed rots, damping-off, root rot and seedling blights. They can also be used to control internal seed–borne fungal pathogens as well as fungal pathogens that are on the surface of the seed. Many biofungicidal products also show capacities to stimulate plant host defence and other physiological processes that can make treated crops more resistant to a variety of biotic and abiotic stresses. No harmful residues produced, i.e. biodegradable. Can be cheaper than chemical pesticides when locally produced. Living organisms evolve and increase their resistance to biological, chemical, physical or any other form of control. If the target population is not exterminated or rendered incapable of reproduction, the surviving population can acquire a tolerance of whatever pressures are brought to bear, resulting in an evolutionary arms race. Unintended consequences: Studies have found broad spectrum biopesticides have lethal and nonlethal risks for non-target native pollinators such as Melipona quadrifasciata in Brazil. ↑ Encouraging innovation in biopesticide development. Archived May 15, 2012, at the Wayback Machine. European Commission (2008). Accessed on 20 April 2012. 1 2 Copping, Leonard G. (2009). The Manual of Biocontrol Agents: A World Compendium. BCPC. ISBN 978-1-901396-17-1. 1 2 Coombs, Amy. "Fighting Microbes with Microbes". The Scientist. Retrieved 18 April 2013. 1 2 Pal, GK; Kumar, B (2013). "Antifungal activity of some common weed extracts against wilt causing fungi, Fusarium oxysporum" (PDF). Current Discovery. International Young Scientist Association for Applied Research and Development. 2 (1): 62–67. ISSN 2320-4400. Retrieved February 8, 2014. 1 2 3 4 5 6 "With BioDirect, Monsanto Hopes RNA Sprays Can Someday Deliver Drought Tolerance and Other Traits to Plants on Demand | MIT Technology Review". Retrieved 2015-08-31. ↑ Kiliç, A; Akay, M. T. (2008). "A three generation study with genetically modified Bt corn in rats: Biochemical and histopathological investigation". Food and Chemical Toxicology. 46 (3): 1164–70. doi:10.1016/j.fct.2007.11.016. PMID 18191319. ↑ Benhamou, N.; Lafontaine, P. J.; Nicole, M. (December 2012). "Induction of Systemic Resistance to Fusarium Crown and Root Rot in Tomato Plants by Seed Treatment with Chitosan" (PDF). Phytopathology. American Phytopathological Society. 84 (12): 1432–44. ISSN 0031-949X. OCLC 796025684. Retrieved February 8, 2014. ↑ Tomé, Hudson Vaner V.; Barbosa, Wagner F.; Martins, Gustavo F.; Guedes, Raul Narciso C. (2015-04-01). "Spinosad in the native stingless bee Melipona quadrifasciata: Regrettable non-target toxicity of a bioinsecticide". Chemosphere. 124: 103–109. doi:10.1016/j.chemosphere.2014.11.038. Registered Biopesticides 04/29/02 United States Environmental Protection Agency. Updated 29 March 2002. Retrieved 25 November 2011.